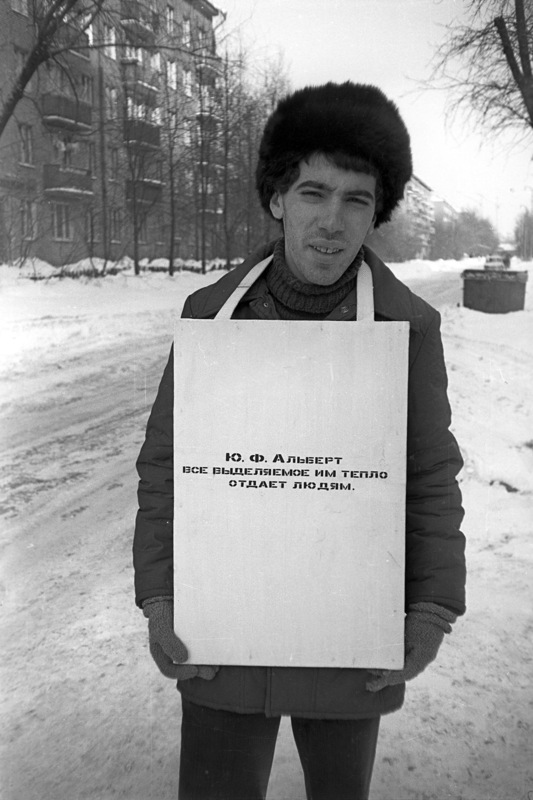 Yuri Albert is one of the most important exponents of Moscow Conceptualism. 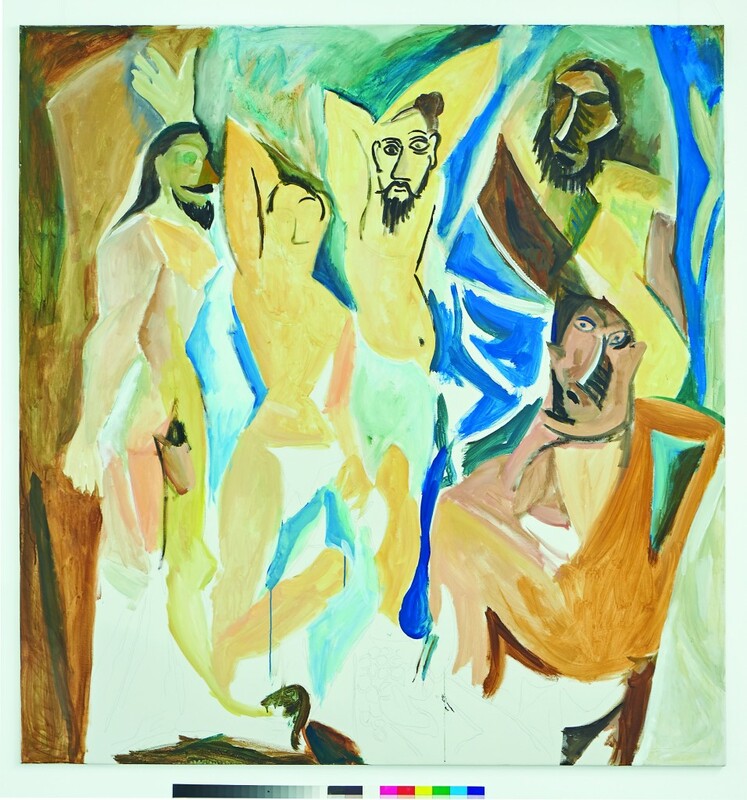 He embarked on his artistic career in the unofficial Soviet cultural milieu in the 1970s. Drawing on the experience in self-organization he gained there, he found his way to his own critical and (self-)ironic reflections on the art system. The Kunstmuseum Liechtenstein will soon be presenting the first comprehensive solo exhibition of works by Yuri Albert ever to be mounted outside Russia: Elitist-Democratic Art, curated by Sandra Frimmel and Sabine Hänsgen, from September 21, 2018 to January 20, 2019. In November 2017, Yuri Albert was a grant recipient in the European Research Council project Performance Art in Eastern Europe (1950–1990): History and Theory at the University of Zurich. 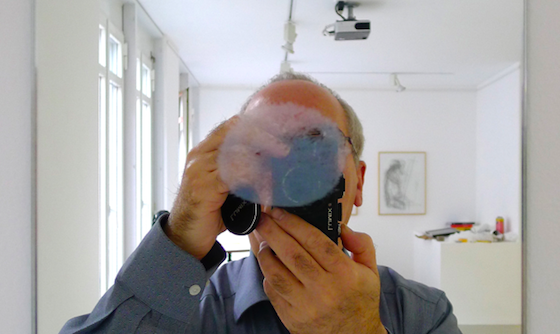 During his stay in Zurich, he staged the exhibition Works and Days at the KulturAtelier Arina Kowner. On that occasion, Sabine Hänsgen talked to him about his experiences in the Moscow underground, concept art between West and East, art as a pastime, and the relationship between tradition and avant-garde, “true” and contemporary art. Sabine Hänsgen: If I remember correctly, we first met in 1982 at the opening of the Apt Art show in the apartment of Nikita Alekseev. In the 1980s, exhibitions of that kind took place on the initiative of the second generation of Moscow Conceptualism, to which you also belong. Back then, we were very impressed by the forms of artistic self-organization outside the confines of the official culture and art market, and by the special atmosphere of community. Does the experience of having been socialized in the milieu of unofficial Moscow culture still have a bearing on your stance as an artist even now that you’ve come to Cologne and commute between Cologne and Moscow? Yuri Albert: Yes. In the final phase of the Soviet Union, a unique form of artists’ self-organization developed outside the bounds of state-controlled culture. The ‘unofficial’ culture of that time can perhaps more aptly be described as ‘illegal’ culture, because the public presentation of all its forms of expression was prohibited and frequently penalized. As a result, its art and literature developed within a close-knit circle reminiscent of the early Christians. And in that circle, the relationship between author and viewer took on a character all its own. Practically all viewers and readers knew each other personally, and nearly all of them were authors themselves. The expression ‘exchange of ideas’ is to be understood literally in that context: “I’ll listen to your poems, and tomorrow you tell me your opinion of my paintings.” Stimulating discussion and sympathetic reception were more or less guaranteed. In this situation it often sufficed to call a friend and say, “You know what; I have the following idea for a work”—and then simply describe the work. After that, it no longer made any sense to make the work: the interaction between artist and viewer had already taken place. This undoubtedly encouraged the realization that already the idea itself was the work, which therefore no longer necessarily had to be carried out. And that, quite generally, is what conceptualism is all about. On the other hand, it’s the reason why the artists of my generation have so few ‘early’ works. There was somehow no need to actually produce the works since you couldn’t sell them, nor did we have anyplace to keep them. To us, the viewer was a mythical figure. We longed for the viewer, dreamed of the viewer, but were also afraid of the viewer. It’s no accident that viewers, or their absence, were the subject matter of many works—from Ilya Kabakov’s projects to my own. That all changed after perestroika. When the first legal exhibitions took place, viewers we no longer knew personally turned up—in other words, viewers as a social group. And that brought about a palpable change in my own art because I was no longer making it for viewers I knew but for viewers I didn’t know. But even they were still people whose cultural baggage and reactions I could imagine—that is, people with a totalitarian background, influenced by cultural clichés like those that had influenced me. When I came to live in Germany, it became ever more difficult for me to imagine and understand my viewers, because they had read different books in their childhood, watched different cartoons, listened to different hits, etc. One of my early works is on view in this show: Yu. F. Albert gives his entire share of warmth to others. In 1979, fifteen people saw this work in an illegal apartment exhibition. But I offer the warmth to everyone. SH: For your exhibition at KulturAtelier Arina Kowner, you decided on a programmatic title: Works and Days, an allusion to the epic poem by Hesiod (ca. 700 BC). 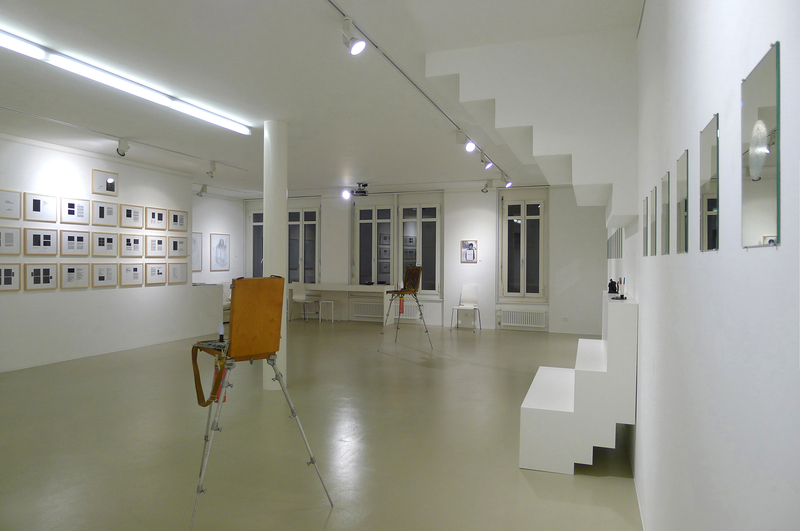 In the exhibition space we see paintings, drawings, sculptures, assemblages, mirror objects, photographs and more. But you didn’t just bring ‘finished’ works with you to Zurich, but also spent your days here. So what’s important for you is to spend time on a certain kind of artistic activity. What role do the traditions of processual art, or in general performative traditions, play in your work? That’s particularly important for a type of art that’s no longer historically linked to previously established professional skills. What does it mean to concern oneself with art when that concern can consist of all kinds of things—from making a drawing in pencil to destroying someone else’s drawings, from digging a pit to selling snowballs on the streets of New York? In the late seventies, I was very impressed by a number of Robert Morris texts (translated by Nadezhda Stolpovskaya) as well as by works of Bruce Nauman, Lynda Benglis and Les Levine from the area of post-minimalist, processual art. In Russian art, you encounter something similar when you leaf through Lev Rubinstein’s poetic index cards, or in the graphic work of Nadezhda Stolpovskaya. Among my own works, there are quite a number where precisely the process of making them is more important than the final product, and precisely the process endows the final product with meaning. These include works such as those where I assemble and sign painting puzzles, trace correspondence by various artists, or copy out press responses to my exhibitions by hand. 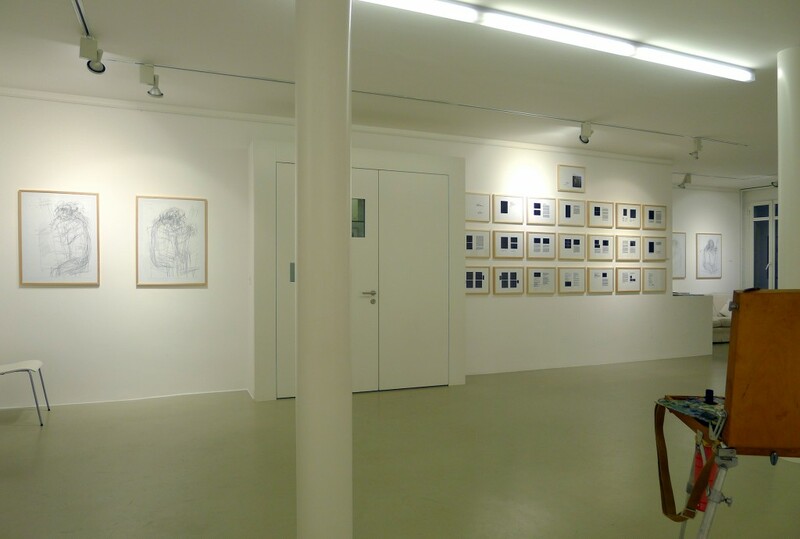 View of the exhibition Works and Days at the KulturAtelier of the Arina Kowner Foundation, Zurich 2017. YA: The project proceeds on the assumption that art can be divided into true and contemporary art. The Marxist critique of modernism was ultimately also based on this juxtaposition. And actually, it’s a pretty productive juxtaposition. For the exponents of European culture—of which Russia can be considered one, if with reservations—, this juxtaposition is quite obvious. When we say “artwork,” we usually envision a painting in a frame or a marble sculpture. Maybe it’s already changed for the younger generation, but for my generation, that’s how it is. When I enter a museum and see a painting by Titian, the question doesn’t come up as to whether or not it’s art. But when I see a composition made of three train tracks and a tape recorder, then maybe it’s not art. Maybe it’s just three parallel train tracks and a tape recorder some railroad worker left behind by accident. When I went to art school and later to the academy, I dreamed of concerning myself with ‘true’ art. In my youthful conception, that was something between van Gogh and Modigliani—something very spiritual, unrepeatable and indescribable. But when I grew up and became an artist, it turned out that there was no longer any art but contemporary art, and never again would be. You dream of creating something true, but in the end all that comes out is something contemporary. Like all artists, I collect the press responses to my work: catalogues, albums, reviews, newspaper articles, etc., and I’m proud of the positive reactions. But unlike other artists, I don’t forget that my art is merely contemporary—and that’s nothing to be proud of. On the contrary, you have to atone for the sin of concerning yourself with contemporary art. That’s why I take tracing paper, place it over printed texts about myself, and trace the texts by hand in ink. Letter by letter, line by line. 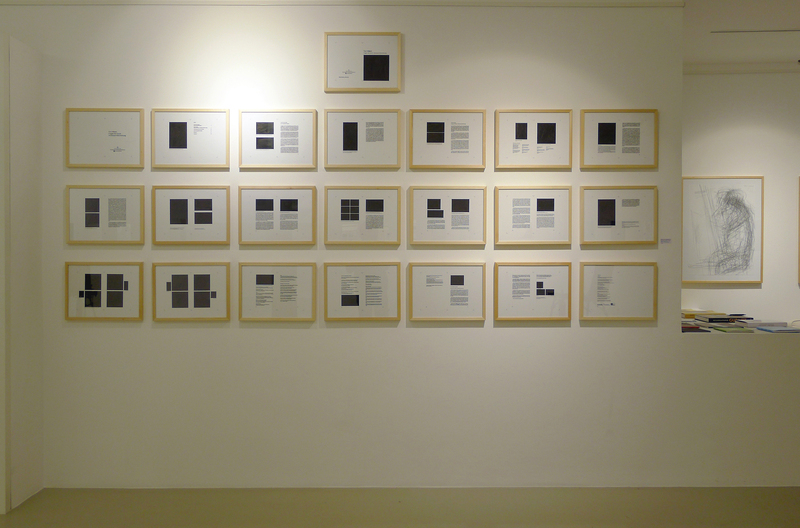 And I put black rectangles in the place of the reproductions. So by these means I’ve produced hundreds of works on paper related to my previous works and exhibitions. When you show people your catalogues, they usually just page through them casually; nobody really reads them. And at exhibition openings, nobody looks at the paintings; people just drink something and chat. But when the same texts hang on the wall in place of paintings, for some reason people start reading them very attentively in order to form a picture of the art of a certain artist by the name of Albert on the basis of a few informative reviews and articles. That’s another important topic for me: art that exists in the retelling, in repetitions, memory and the imagination. SH: Another long-term project of yours are the self-portraits you’ve been drawing blindfolded since 1996. 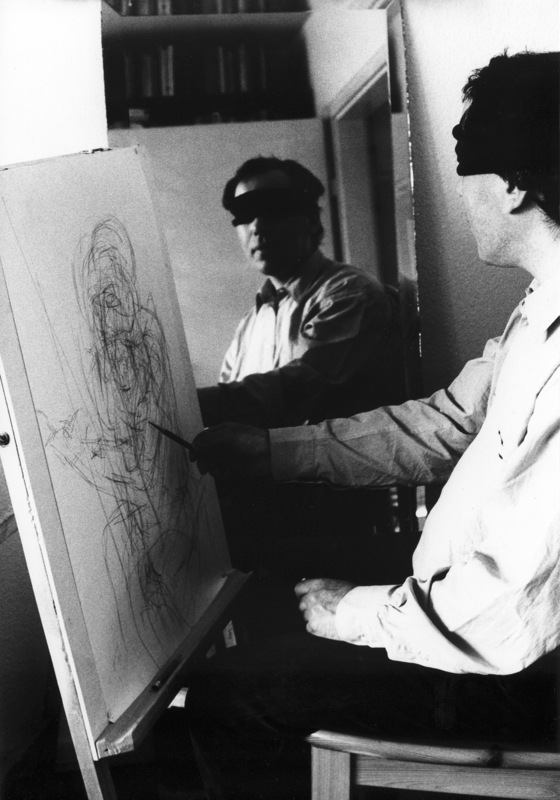 In the process, you transform into a blind draughtsman by setting yourself up very traditionally in front of an easel and a mirror—wearing a black blindfold. So the self-portrait becomes a self-experiment. Could you explain the experimental setup in a bit more detail? YA: The self-portrait is one of the most important genres for an artist. In the old days, when paintings were produced on commission or for sale, a customer could determine how well a certain artist worked by looking at his self-portraits. Later the self-portrait became a kind of artist’s manifesto in which he demonstrated his view of the role and place of the artist in the world. Paradoxically, the self-portrait gained even further significance in modern art. The paradox lies in the fact that the history of modern art—although it came about according to the motto “That’s how I see it”—actually boiled down to a gradual renunciation of sight, of looking at the world. At first sight, my Self-Portraits with Blindfolded Eyes are reminiscent of the Surrealists’ experiments with automatic writing. But I’m not really interested in playing with the subconscious. On the contrary, what I’m interested in is how much of the superconscious, the general, the banal, the recognizable remains when you work this way. Essentially, it’s easy to see that they’re self-portraits, just on the basis of the composition and the figure’s pose. But you can’t tell at all whose self-portraits they are. In a sense they’re ‘self-portraits as such,’ models of the self-portrait. There’s no author here. SH: And another fragment from a long-term project is also on view in the exhibition: I Am Still Alive. I see this series of mirror objects as a kind of self-portrait as well, in which a certain tension develops between the visual dimension (the mirror image) and the performative dimension (the daily act of breathing on the mirror). The work’s technical data is very unusual: “mirror, breath, screen print.” How did you use that technique? YA: I think it would be best to start by explaining exactly how I carry out this project. Every day, I breathe on a mirror as if to make sure I’m still alive. Then I scan the cloudy spot I’ve made on the mirror with my breath. Then I use a transparent lacquer to print each spot on a mirror. Altogether there are going to be 365 mirrors, corresponding to the number of days in a year. Obviously, this project belongs to the group of my works concerned with monotonous, everyday actions. On the other hand, it also bears a connection to another group of my works, the ones having to do with abstract painting (paintings carried out with the ashes of burned books, etc.). I’ve always been interested in the content of abstract paintings, in what all the brushstrokes, blots and rectangles might mean. How do they convey what many art scholars refer to as the “breath of life”? Why should I believe, for example, that one painting expresses a “feeling of cosmic loneliness” and another “joie de vivre” or a “metaphysical void”? What is the trust in the artist founded in? Every one of these mirrors is a small abstract painting that informs us that the painter is still alive, that he’s still breathing—if you believe my description of how I made them. SH: In your work you repeatedly enter into dialogue with the oeuvres of other artists—in the case of the series I Am Still Alive, for example, with the oeuvre of On Kawara. There’s also the Unfinished Sketch for the Large Painting ‘Les Grands-Papas d’Avignon,’ whose title signals a connection to a key work by Pablo Picasso that introduced Cubism to modern painting. Now Picasso’s young girls have become grandfathers. What are we to make of this reversal? YA: Yes, there are lots of works in my oeuvre that make reference to works by other artists—from world-famous ones to close friends of mine. 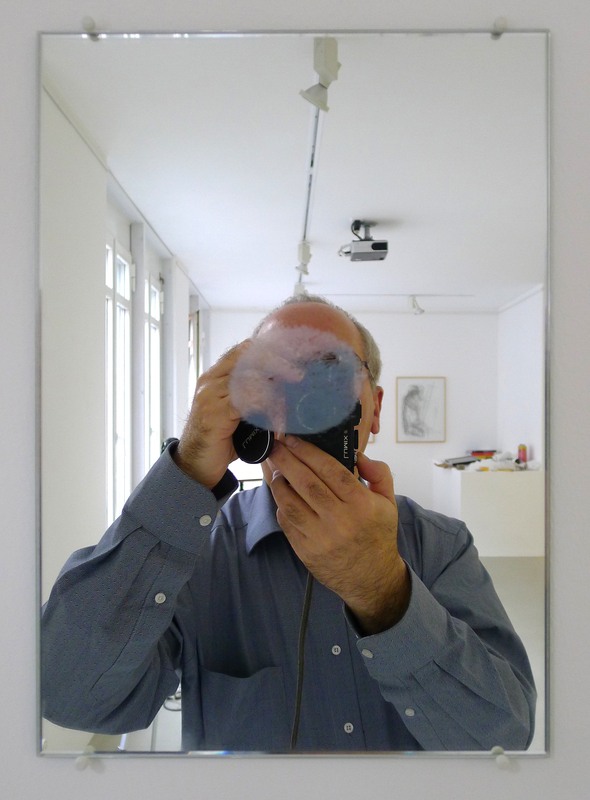 In the series I Am Still Alive, by the way, I’m not just referring to On Kawara, but also to Alexander Brener, who also breathed on mirrors during an art action. In one of my first texts I wrote that, for me, the relationships between artists and works—for example in the form of influences, appropriations, retorts or plagiarisms—are more important than the works themselves. A work only becomes an artwork in the process of comparing it to other works. Even paintings of the past, for example the portraits by Frans Hals, can’t be compared to living persons, but only to other portraits. That’s why it seems so strange to me when artists deny that they’ve been influenced by someone, or that they’ve made use of other people’s discoveries in their works. On the contrary, the more things various artists can be found to have in common, the more interesting it all is. We always work in co-authorship—with the entire history of art. Artists always continue the work of their predecessors. But in the process they often make mistakes, and their mistakes bring about new discoveries. Misunderstood Impressionism and a misunderstood theory by Chevreuil were the basis of Pointillism. Russian Futurism and Moscow Conceptualism are in many ways also results of failures to understand. In Russian, grandfathers (dedushki) differ from girls (devushki) by just one letter. It’s as if I misheard the title—and the work’s meaning changes entirely. I’m planning to carry out other works by this method. By the way, my friend Victor Skersis was doing similar things years ago. So I’m not only repeating Picasso but also Skersis, but both of them with mistakes. SH: In the exhibition, there are also a number of sculptural works revolving around the art system. 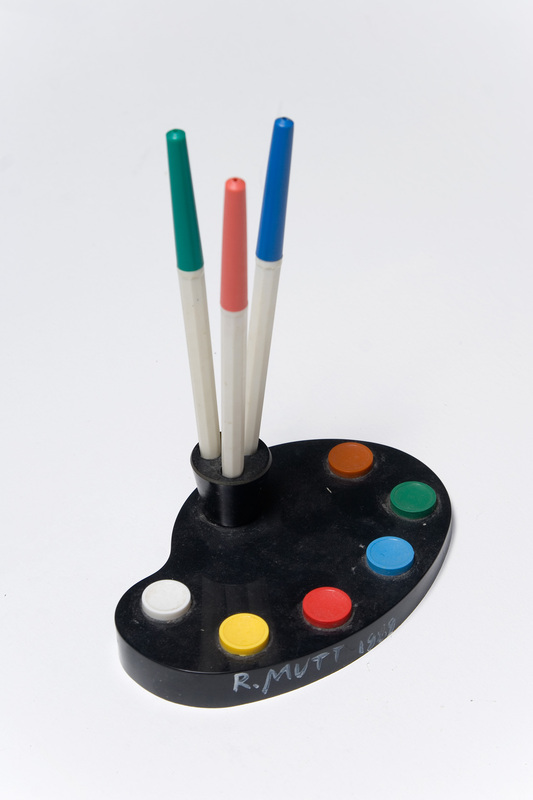 For example an object you once purchased in a Soviet stationery store: a ballpoint pen stand in the form of a palette. This is a ready-made, as we are informed by the title. But what constitutes your polemic with the conception of the ready-made à la Marcel Duchamp? YA: Yes, I have a whole series of “anti-Duchamp” objects. Here my concern is with the fact that, over the past hundred years, artists have been doing everything in their power to destroy the boundary between art and life, either by taking little excursions ‘into life’ or by taking art into an area that didn’t used to be art. Ever since Marcel Duchamp exhibited his ready-mades, one army of artists after another has been dragging new garbage onto the territory of art and claiming that everything they call art is art. As a result, the territory of art—museums, galleries, collections and studios—are full of objects you wouldn’t think of as art if you came across them by chance on the street. But this territory has turned out to be limited: the more garbage finds its way there, the less space remains for art’s traditional attributes: paintings, frames, plaster casts, draperies, brush and palette. The ecology of art has been irreversibly destroyed. I found this plastic palette in a shop where it was assigned the pathetic role of a souvenir in the form of a ballpoint pen stand. I made an attempt to return the palette to the milieu of its traditional existence. These days, there’s only one way of doing that: to define it as a ready-made. That’s why I signed the pen stand “R. Mutt,” the same way Duchamp signed his Fountain. 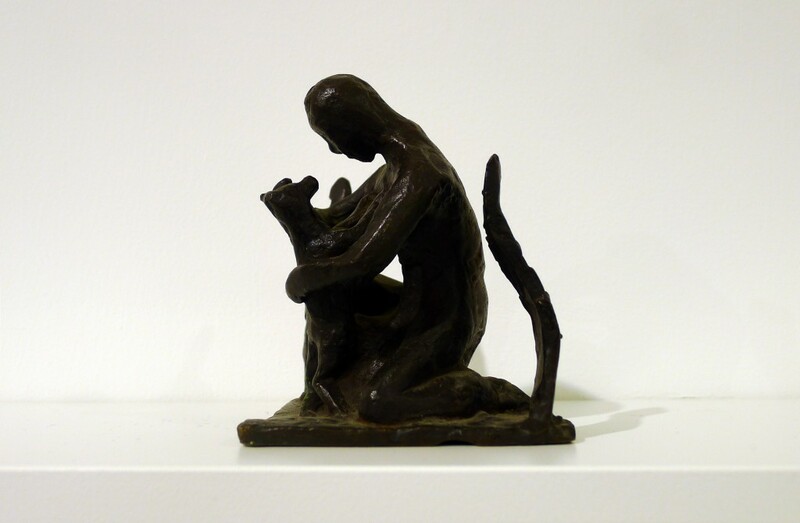 SH: Now I’d like to turn to what I consider the most enigmatic object in the show—the bronze sculpture Boy with Dog of 1965. It might remind one of a modern sculpture, but there’s an incredible autobiographical story behind it. Could you tell the story? YA: Like most boys, I used to form little soldier figures out of modelling clay when I was little. My parents thought that I had a family-based gift for sculpture. So they sent me to a pioneer palace, even if, to be honest, I don’t have a particular gift for sculpture. I made this little sculpture out of modelling clay in 1969, when I was ten. My parents decided I was talented, and when the opportunity arose, they sent it to Paris to the famous French Cubist sculptor Jacques Lipchitz, who was a relative of ours. They were probably hoping he would recognize a worthy successor to the family tradition in me. But all he did was cast my figure in bronze and send it back to Moscow. Maybe he even improved it a bit… It was right around that time that I failed the exam for admission to the sculpture class at the Moscow art high school. I never worked with sculpture again. The statuette just stood on a shelf for years, gathering dust. If you want, you can draw various far-reaching conclusions from that story, or create a biographical legend. But I’m not convinced that that’s absolutely necessary. All that’s really important here is the fact that it’s the first example in my oeuvre of at least a one-sided co-authorship with another artist. SH: I have one last question before we turn the gas burners back on and their noise fills the room: how did your assemblage of gas burner, easel, paint and fire come to be called Mucius Scaevola? YA: This object dates from 1995. I first used it in the installation Mom, Look, an Artist! Here of course it’s an allusion to the eternal fire—a kind of monument to the unknown artist. It’s a reminder of the impossibility of ‘simply’ concerning oneself with art, and with painting in particular. At the same time, it makes reference to Jannis Kounellis’s works with fire and to classical mythology. Back in the days when artists painted scenes from history and classical mythology, people thought scenes of the great deeds of ancient heroes—the oath of the Horatii, the magnanimity of Scipio Africanus, the heroic deed of Mucius Scaevola—would educate the viewers and serve as models of romantic heroism. Before the eyes of King Porsena, Mucius put his right hand into the fire on the sacrificial altar, and the Etruscans, deeply impressed by his bravery, withdrew from Rome. Rome was saved, but the injury to his right hand was so bad that he could no longer hold a brush in it, and it’s impossible to paint a real painting with your left hand alone. Yuri Albert was born in Moscow in 1959. He met Vitaly Komar and Alexander Melamid, the founders of Soz Art, in 1975. In their studio he became acquainted with the contemporary art prohibited in the Soviet Union at the time, including conceptualism. He studied graphic art at the Moscow State Pedagogical Institute from 1977 to 1980. In 1979 he began participating in illegal Moscow Conceptualism exhibitions. The same year, he organized a conceptualist group exhibition in his own apartment. In the 1980s he took part in the Apt Art shows and became a member of KLAVA, the Moscow Club of Avant-Garde Artists. Albert has been a member of the Kupidon group since 2008. He received the Kandinsky Prize in 2011 and the Russian Innovation Prize in 2013. In 2012 he curated the exhibition Moscow Conceptualism: The Beginning at the Arsenal (State Center of Contemporary Arts) in Nizhny Novgorod. A retrospective of Yuri Albert’s oeuvre entitled What did the artist mean by that? took place at the Moscow Museum of Modern Art in 2013. Yuri Albert has been living and working in Moscow and Cologne since 1990.